Feiwel & Friends, 9781250060143, 448pp. As a young girl, Hillary Diane Rodham’s parents told her she could be whatever she wanted--as long as she was willing to work for it. Hillary took those words and ran. In a life on the front row of modern American history, she has always stood out--whether she was a teen campaigning for the 1964 Republican presidential candidate, winning recognition in Life magazine for her pointed words as the first student commencement speaker at Wellesley College, or working on the Richard Nixon impeachment case as a newly minted lawyer. 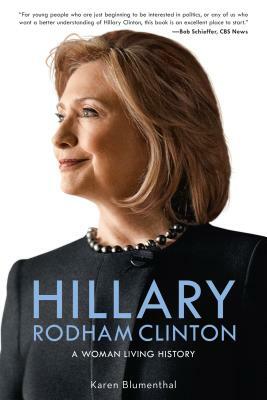 In Hillary Rodham Clinton: A Woman Living History, critically acclaimed author Karen Blumenthal gives us an intimate and unflinching look at the public and personal life of Hillary Rodham Clinton. Illustrated throughout with black-and-white photographs and political cartoons, this is a must-have biography about a woman who has fascinated--and divided--the public, who continues to push boundaries, and who isn’t afraid to reach for one more goal. Karen Blumenthal is an award-winning children's non-fiction writer and a long-time journalist. Her book Bootleg: Murder, Moonshine, and the Lawless Years of Prohibition received four starred reviews and was a finalist for the YALSA Excellence in Nonfiction for Young Adults Award. Later, Six Days in October: The Stock Market Crash of 1929, was named a Sibert Honor Book, and Let Me Play: The Story of Title IX, won a Jane Addams Children's Book Award. Karen's recent book, Tommy: The Gun That Changed America, explores the history and controversy of the famous and deadly Tommy gun. She lives in Dallas, Texas.